Dimensions: 10.5" x 4.5" x 22"
You may have gotten lucky enough to get assigned a suite-style dorm room when you start college. This is pretty exciting. You'll have a few roommates and you'll also have your own dorm bathroom that is shared only between you and your dorm roommates. Of course that means there will be some extra college supplies in your dorm essentials list. Of course this isn't a bad thing because that means you'll be able to create an awesome dorm room decor for your dorm bathroom and your college dorm room! One thing that can add or detract from your dorm room decor in your bathroom are all those shampoo, conditioner, and body wash bottles as well as other shower dorm necessities. When they're hanging out on the ledge of your dorm shower, they can detract from your bathroom dorm room decorations and they can also fall painfully onto your feet. This is even more so if they are just hanging out on the floor of your dorm room shower. Avoid this with our Adjustable Dorm Shower Caddy! Our Adjustable Dorm Shower Caddy is a pretty awesome dorm essential. 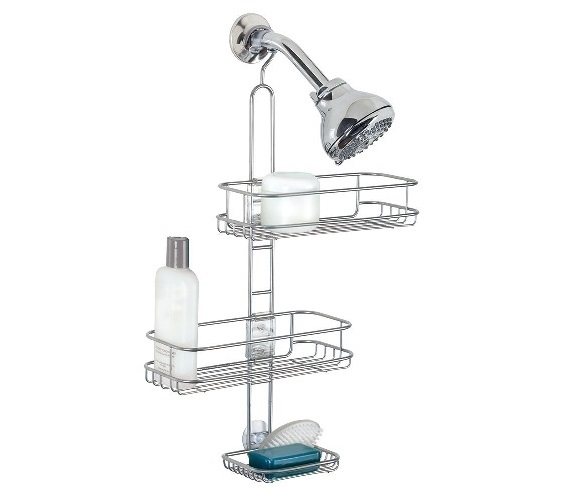 It has two large baskets for shampoo and conditioner bottles and one small basket for bar soap and shavers. This already seems pretty great, but it gets better - the baskets adjust left and right to accommodate for the size of your bottles! Shampoo, conditioner and body wash bottles come in different sizes, especially if you're dorm room shopping for the largest size available to save money. 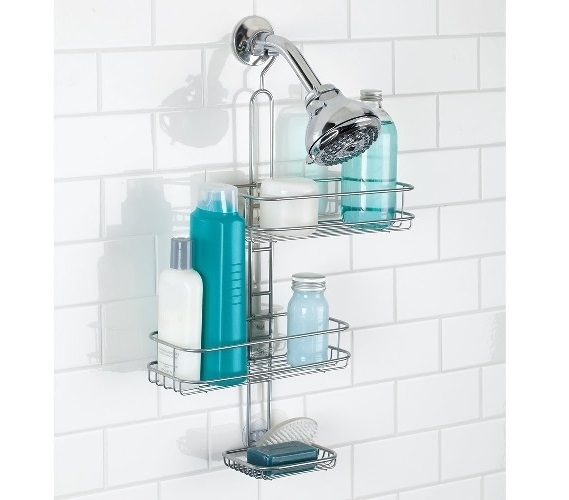 This dorm essential dorm shower caddy hangs from your dorm showerhead to save space and takes into account that you may have different sized bottles. With this dorm necessity, you don't have to move around your over sized bottles to try to get them to fit - move the baskets instead!